Most cat owners know cats LOVE cardboard boxes, paper bags, and other confined spaces. Leave a cardboard box on the floor and the cat will find a way to squeeze into it. 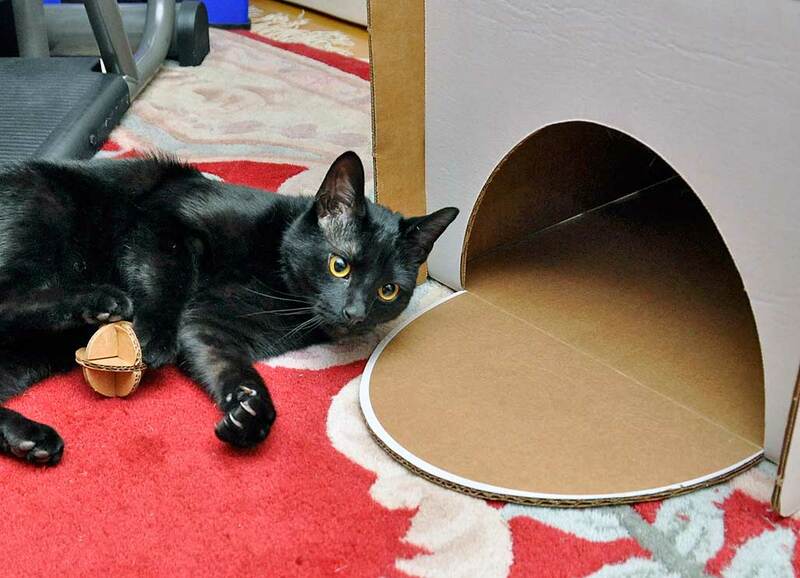 So when we saw that a company had created a “corrugated habitat” for cats, we knew we had to check it out. Caboodle is made with 350 lb double-wall corrugated cardboard. It is more than twice as thick as the average shipping box and should be extremely durable. The product is made in the USA in the San Francisco Bay Area. The cardboard is made from 40% recycled material and is 100% recyclable. Non-toxic soy-based inks are used for printing. Caboodle is manufactured, assembled, and packaged all in the same location, significantly reducing its carbon foot print. The Caboodle is shipped in as a flat-pack and assembly is required. The designer of the Caboodle has made the assmbly as simple as possible. Each panel has a symbol next to the where they connect. Just match up and slide the appropriate pieces together. The interns had no problem understanding how the Caboodle was to be assembled. Anyone with opposable thumbs should be able to do it in a few minutes. The Caboodle was surprisingly strong and sturdy. It had no problem dealing with bothEliot and Milo climbing in and out of it at the same time. The structure was able to support them even when they were behaving rambunctiously. The cats really seem to enjoy looking through and poking at all of the different cut-outs…especially if there is another cat on the other side. There is also a cut-out between the bottom and middle levels so that the cats can climb up (or whack at each other) from the inside. 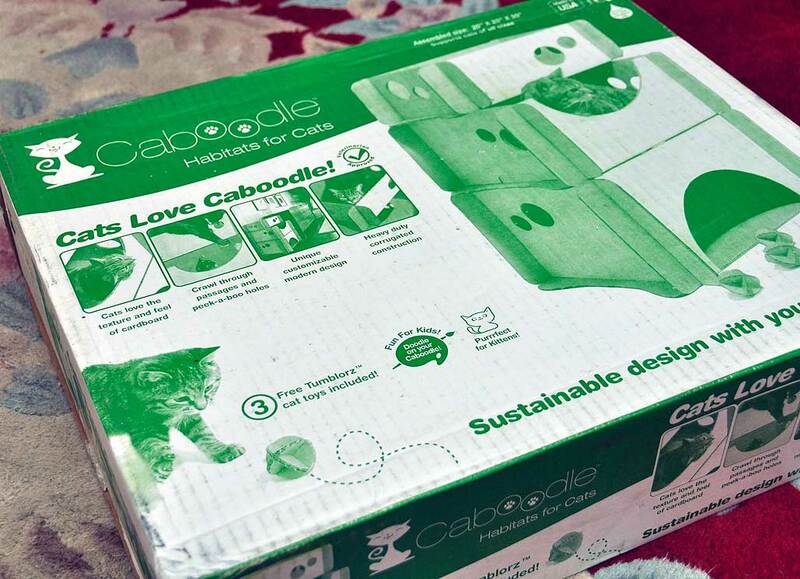 We have to admit, this Caboodle Cat habitat exceeded our expectations. It was simple to assemble, easy to put away, and will be a great addition for a playroom. While the Caboodle is a guarant3ee hit with kittens, it will still be fun for grown cats. So, if you want to create a cozy play environment for your feline friends, but don’t want to get one of those large hulking “cat trees,” check out the Caboodle Corrugated Habitat for cats from Play Products. Your “interns” will thank you for it (P.S. Buy it from the company website, it’s cheaper than amazon! ).